Liczba stron: 743 Jest to ujednolicona liczba stron, która ułatwi Ci porównanie długości książek. Każda strona Legimi to 200 słów. 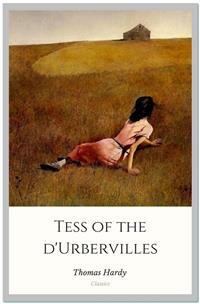 Tess of the d'Urbervilles is a harrowing critique of social class and the powerlessness of women. Tess, a beautiful young woman, is pushed on her rich "relatives" by her grasping father. When the young Lord does with her as he likes, Tess's whole life falls into ruins from which she attempts to free herself. The novel met with mixed reviews upon publication, because it challenged the precepts of society. It is now considered a classic of English literature. "Daze my eyes, and isn't there?" said Durbeyfield. "And here have I been knocking about, year after year, from pillar to post, as if I was no more than the commonest feller in the parish... And how long hev this news about me been knowed, Pa'son Tringham?" "Well, I have heard once or twice, 'tis true, that my family had seen better days afore they came to Blackmoor. But I took no notice o't, thinking it to mean that we had once kept two horses where we now keep only one. I've got a wold silver spoon, and a wold graven seal at home, too; but, Lord, what's a spoon and seal? ... And to think that I and these noble d'Urbervilles were one flesh all the time. 'Twas said that my gr't-granfer had secrets, and didn't care to talk of where he came from... And where do we raise our smoke, now, parson, if I may make so bold; I mean, where do we d'Urbervilles live?" "Do you, do you? That's the secret--that's the secret! Now obey my orders, and take the message I'm going to charge 'ee wi'... Well, Fred, I don't mind telling you that the secret is that I'm one of a noble race--it has been just found out by me this present afternoon, P.M." And as he made the announcement, Durbeyfield, declining from his sitting position, luxuriously stretched himself out upon the bank among the daisies. The village of Marlott lay amid the north-eastern undulations of the beautiful Vale of Blakemore, or Blackmoor, aforesaid, an engirdled and secluded region, for the most part untrodden as yet by tourist or landscape-painter, though within a four hours' journey from London. It is a vale whose acquaintance is best made by viewing it from the summits of the hills that surround it--except perhaps during the droughts of summer. An unguided ramble into its recesses in bad weather is apt to engender dissatisfaction with its narrow, tortuous, and miry ways. The forests have departed, but some old customs of their shades remain. Many, however, linger only in a metamorphosed or disguised form. The May-Day dance, for instance, was to be discerned on the afternoon under notice, in the guise of the club revel, or "club-walking," as it was there called. The banded ones were all dressed in white gowns--a gay survival from Old Style days, when cheerfulness and May-time were synonyms--days before the habit of taking long views had reduced emotions to a monotonous average. Their first exhibition of themselves was in a processional march of two and two round the parish. Ideal and real clashed slightly as the sun lit up their figures against the green hedges and creeper-laced house-fronts; for, though the whole troop wore white garments, no two whites were alike among them. Some approached pure blanching; some had a bluish pallor; some worn by the older characters (which had possibly lain by folded for many a year) inclined to a cadaverous tint, and to a Georgian style. In addition to the distinction of a white frock, every woman and girl carried in her right hand a peeled willow wand, and in her left a bunch of white flowers. The peeling of the former, and the selection of the latter, had been an operation of personal care. There were a few middle-aged and even elderly women in the train, their silver-wiry hair and wrinkled faces, scourged by time and trouble, having almost a grotesque, certainly a pathetic, appearance in such a jaunty situation. In a true view, perhaps, there was more to be gathered and told of each anxious and experienced one, to whom the years were drawing nigh when she should say, "I have no pleasure in them," than of her juvenile comrades. But let the elder be passed over here for those under whose bodices the life throbbed quick and warm. The young girls formed, indeed, the majority of the band, and their heads of luxuriant hair reflected in the sunshine every tone of gold, and black, and brown. Some had beautiful eyes, others a beautiful nose, others a beautiful mouth and figure: few, if any, had all. A difficulty of arranging their lips in this crude exposure to public scrutiny, an inability to balance their heads, and to dissociate self-consciousness from their features, was apparent in them, and showed that they were genuine country girls, unaccustomed to many eyes. And as each and all of them were warmed without by the sun, so each had a private little sun for her soul to bask in; some dream, some affection, some hobby, at least some remote and distant hope which, though perhaps starving to nothing, still lived on, as hopes will. They were all cheerful, and many of them merry. "The Load-a-Lord! Why, Tess Durbeyfield, if there isn't thy father riding hwome in a carriage!" The clubbists tittered, except the girl called Tess--in whom a slow heat seemed to rise at the sense that her father was making himself foolish in their eyes. "He's tired, that's all," she said hastily, "and he has got a lift home, because our own horse has to rest to-day." "Bless thy simplicity, Tess," said her companions. "He's got his market-nitch. Haw-haw!" "Look here; I won't walk another inch with you, if you say any jokes about him!" Tess cried, and the colour upon her cheeks spread over her face and neck. In a moment her eyes grew moist, and her glance drooped to the ground. Perceiving that they had really pained her they said no more, and order again prevailed. Tess's pride would not allow her to turn her head again, to learn what her father's meaning was, if he had any; and thus she moved on with the whole body to the enclosure where there was to be dancing on the green. By the time the spot was reached she has recovered her equanimity, and tapped her neighbour with her wand and talked as usual. Tess Durbeyfield at this time of her life was a mere vessel of emotion untinctured by experience. The dialect was on her tongue to some extent, despite the village school: the characteristic intonation of that dialect for this district being the voicing approximately rendered by the syllable UR, probably as rich an utterance as any to be found in human speech. The pouted-up deep red mouth to which this syllable was native had hardly as yet settled into its definite shape, and her lower lip had a way of thrusting the middle of her top one upward, when they closed together after a word. Phases of her childhood lurked in her aspect still. As she walked along to-day, for all her bouncing handsome womanliness, you could sometimes see her twelfth year in her cheeks, or her ninth sparkling from her eyes; and even her fifth would flit over the curves of her mouth now and then. Yet few knew, and still fewer considered this. A small minority, mainly strangers, would look long at her in casually passing by, and grow momentarily fascinated by her freshness, and wonder if they would ever see her again: but to almost everybody she was a fine and picturesque country girl, and no more. Nothing was seen or heard further of Durbeyfield in his triumphal chariot under the conduct of the ostleress, and the club having entered the allotted space, dancing began. As there were no men in the company, the girls danced at first with each other, but when the hour for the close of labour drew on, the masculine inhabitants of the village, together with other idlers and pedestrians, gathered round the spot, and appeared inclined to negotiate for a partner. Among these on-lookers were three young men of a superior class, carrying small knapsacks strapped to their shoulders, and stout sticks in their hands. Their general likeness to each other, and their consecutive ages, would almost have suggested that they might be, what in fact they were, brothers. The eldest wore the white tie, high waistcoat, and thin-brimmed hat of the regulation curate; the second was the normal undergraduate; the appearance of the third and youngest would hardly have been sufficient to characterize him; there was an uncribbed, uncabined aspect in his eyes and attire, implying that he had hardly as yet found the entrance to his professional groove. That he was a desultory tentative student of something and everything might only have been predicted of him. These three brethren told casual acquaintance that they were spending their Whitsun holidays in a walking tour through the Vale of Blackmoor, their course being south-westerly from the town of Shaston on the north-east. They leant over the gate by the highway, and inquired as to the meaning of the dance and the white-frocked maids. The two elder of the brothers were plainly not intending to linger more than a moment, but the spectacle of a bevy of girls dancing without male partners seemed to amuse the third, and make him in no hurry to move on. He unstrapped his knapsack, put it, with his stick, on the hedge-bank, and opened the gate. "What are you going to do, Angel?" asked the eldest. "I am inclined to go and have a fling with them. Why not all of us--just for a minute or two--it will not detain us long?" "No--no; nonsense!" said the first. "Dancing in public with a troop of country hoydens--suppose we should be seen! Come along, or it will be dark before we get to Stourcastle, and there's no place we can sleep at nearer than that; besides, we must get through another chapter of A Counterblast to Agnosticism before we turn in, now I have taken the trouble to bring the book." "All right--I'll overtake you and Cuthbert in five minutes; don't stop; I give my word that I will, Felix." The two elder reluctantly left him and walked on, taking their brother's knapsack to relieve him in following, and the youngest entered the field. "This is a thousand pities," he said gallantly, to two or three of the girls nearest him, as soon as there was a pause in the dance. "Where are your partners, my dears?" "They've not left off work yet," answered one of the boldest. "They'll be here by and by. Till then, will you be one, sir?" "Certainly. But what's one among so many!" "Better than none. 'Tis melancholy work facing and footing it to one of your own sort, and no clipsing and colling at all. Now, pick and choose." "'Ssh--don't be so for'ard!" said a shyer girl. The young man, thus invited, glanced them over, and attempted some discrimination; but, as the group were all so new to him, he could not very well exercise it. He took almost the first that came to hand, which was not the speaker, as she had expected; nor did it happen to be Tess Durbeyfield. Pedigree, ancestral skeletons, monumental record, the d'Urberville lineaments, did not help Tess in her life's battle as yet, even to the extent of attracting to her a dancing-partner over the heads of the commonest peasantry. So much for Norman blood unaided by Victorian lucre. The name of the eclipsing girl, whatever it was, has not been handed down; but she was envied by all as the first who enjoyed the luxury of a masculine partner that evening. Yet such was the force of example that the village young men, who had not hastened to enter the gate while no intruder was in the way, now dropped in quickly, and soon the couples became leavened with rustic youth to a marked extent, till at length the plainest woman in the club was no longer compelled to foot it on the masculine side of the figure. The church clock struck, when suddenly the student said that he must leave--he had been forgetting himself--he had to join his companions. As he fell out of the dance his eyes lighted on Tess Durbeyfield, whose own large orbs wore, to tell the truth, the faintest aspect of reproach that he had not chosen her. He, too, was sorry then that, owing to her backwardness, he had not observed her; and with that in his mind he left the pasture. On account of his long delay he started in a flying-run down the lane westward, and had soon passed the hollow and mounted the next rise. He had not yet overtaken his brothers, but he paused to get breath, and looked back. He could see the white figures of the girls in the green enclosure whirling about as they had whirled when he was among them. They seemed to have quite forgotten him already. All of them, except, perhaps, one. This white shape stood apart by the hedge alone. From her position he knew it to be the pretty maiden with whom he had not danced. Trifling as the matter was, he yet instinctively felt that she was hurt by his oversight. He wished that he had asked her; he wished that he had inquired her name. She was so modest, so expressive, she had looked so soft in her thin white gown that he felt he had acted stupidly. However, it could not be helped, and turning, and bending himself to a rapid walk, he dismissed the subject from his mind. As for Tess Durbeyfield, she did not so easily dislodge the incident from her consideration. She had no spirit to dance again for a long time, though she might have had plenty of partners; but ah! they did not speak so nicely as the strange young man had done. It was not till the rays of the sun had absorbed the young stranger's retreating figure on the hill that she shook off her temporary sadness and answered her would-be partner in the affirmative. She remained with her comrades till dusk, and participated with a certain zest in the dancing; though, being heart-whole as yet, she enjoyed treading a measure purely for its own sake; little divining when she saw "the soft torments, the bitter sweets, the pleasing pains, and the agreeable distresses" of those girls who had been wooed and won, what she herself was capable of in that kind. The struggles and wrangles of the lads for her hand in a jig were an amusement to her--no more; and when they became fierce she rebuked them. She might have stayed even later, but the incident of her father's odd appearance and manner returned upon the girl's mind to make her anxious, and wondering what had become of him she dropped away from the dancers and bent her steps towards the end of the village at which the parental cottage lay. The cradle-rocking and the song would cease simultaneously for a moment, and an exclamation at highest vocal pitch would take the place of the melody. "God bless thy diment eyes! And thy waxen cheeks! And thy cherry mouth! And thy Cubit's thighs! And every bit o' thy blessed body!" After this invocation the rocking and the singing would recommence, and the "Spotted Cow" proceed as before. So matters stood when Tess opened the door and paused upon the mat within it, surveying the scene. The interior, in spite of the melody, struck upon the girl's senses with an unspeakable dreariness. From the holiday gaieties of the field--the white gowns, the nosegays, the willow-wands, the whirling movements on the green, the flash of gentle sentiment towards the stranger--to the yellow melancholy of this one-candled spectacle, what a step! Besides the jar of contrast there came to her a chill self-reproach that she had not returned sooner, to help her mother in these domesticities, instead of indulging herself out-of-doors. There stood her mother amid the group of children, as Tess had left her, hanging over the Monday washing-tub, which had now, as always, lingered on to the end of the week. Out of that tub had come the day before--Tess felt it with a dreadful sting of remorse--the very white frock upon her back which she had so carelessly greened about the skirt on the damping grass--which had been wrung up and ironed by her mother's own hands. As usual, Mrs Durbeyfield was balanced on one foot beside the tub, the other being engaged in the aforesaid business of rocking her youngest child. The cradle-rockers had done hard duty for so many years, under the weight of so many children, on that flagstone floor, that they were worn nearly flat, in consequence of which a huge jerk accompanied each swing of the cot, flinging the baby from side to side like a weaver's shuttle, as Mrs Durbeyfield, excited by her song, trod the rocker with all the spring that was left in her after a long day's seething in the suds. Nick-knock, nick-knock, went the cradle; the candle-flame stretched itself tall, and began jigging up and down; the water dribbled from the matron's elbows, and the song galloped on to the end of the verse, Mrs Durbeyfield regarding her daughter the while. Even now, when burdened with a young family, Joan Durbeyfield was a passionate lover of tune. No ditty floated into Blackmoor Vale from the outer world but Tess's mother caught up its notation in a week. There still faintly beamed from the woman's features something of the freshness, and even the prettiness, of her youth; rendering it probable that the personal charms which Tess could boast of were in main part her mother's gift, and therefore unknightly, unhistorical. "I'll rock the cradle for 'ee, mother," said the daughter gently. "Or I'll take off my best frock and help you wring up? I thought you had finished long ago." Her mother bore Tess no ill-will for leaving the housework to her single-handed efforts for so long; indeed, Joan seldom upbraided her thereon at any time, feeling but slightly the lack of Tess's assistance whilst her instinctive plan for relieving herself of her labours lay in postponing them. To-night, however, she was even in a blither mood than usual. There was a dreaminess, a pre-occupation, an exaltation, in the maternal look which the girl could not understand. "Since I've been away?" Tess asked. "Had it anything to do with father's making such a mommet of himself in thik carriage this afternoon? Why did 'er? I felt inclined to sink into the ground with shame!" "That wer all a part of the larry! We've been found to be the greatest gentlefolk in the whole county--reaching all back long before Oliver Grumble's time--to the days of the Pagan Turks--with monuments, and vaults, and crests, and 'scutcheons, and the Lord knows what all. In Saint Charles's days we was made Knights o' the Royal Oak, our real name being d'Urberville! ... Don't that make your bosom plim? 'Twas on this account that your father rode home in the vlee; not because he'd been drinking, as people supposed." "I'm glad of that. Will it do us any good, mother?" "O yes! 'Tis thoughted that great things may come o't. No doubt a mampus of volk of our own rank will be down here in their carriages as soon as 'tis known. Your father learnt it on his way hwome from Shaston, and he has been telling me the whole pedigree of the matter." Her mother gave irrelevant information by way of answer: "He called to see the doctor to-day in Shaston. It is not consumption at all, it seems. It is fat round his heart, 'a says. There, it is like this." Joan Durbeyfield, as she spoke, curved a sodden thumb and forefinger to the shape of the letter C, and used the other forefinger as a pointer. "'At the present moment,' he says to your father, 'your heart is enclosed all round there, and all round there; this space is still open,' 'a says. 'As soon as it do meet, so,'"--Mrs Durbeyfield closed her fingers into a circle complete--"'off you will go like a shadder, Mr Durbeyfield,' 'a says. 'You mid last ten years; you mid go off in ten months, or ten days.'" Her mother put on a deprecating look. "Now don't you be bursting out angry! The poor man--he felt so rafted after his uplifting by the pa'son's news--that he went up to Rolliver's half an hour ago. He do want to get up his strength for his journey to-morrow with that load of beehives, which must be delivered, family or no. He'll have to start shortly after twelve to-night, as the distance is so long." All these young souls were passengers in the Durbeyfield ship--entirely dependent on the judgement of the two Durbeyfield adults for their pleasures, their necessities, their health, even their existence. If the heads of the Durbeyfield household chose to sail into difficulty, disaster, starvation, disease, degradation, death, thither were these half-dozen little captives under hatches compelled to sail with them--six helpless creatures, who had never been asked if they wished for life on any terms, much less if they wished for it on such hard conditions as were involved in being of the shiftless house of Durbeyfield. Some people would like to know whence the poet whose philosophy is in these days deemed as profound and trustworthy as his song is breezy and pure, gets his authority for speaking of "Nature's holy plan." "Abraham," she said to her little brother, "do you put on your hat--you bain't afraid?--and go up to Rolliver's, and see what has gone wi' father and mother." "--Being a few private friends I've asked in to keep up club-walking at my own expense," the landlady exclaimed at the sound of footsteps, as glibly as a child repeating the Catechism, while she peered over the stairs. "Oh, 'tis you, Mrs Durbeyfield--Lard--how you frightened me!--I thought it might be some gaffer sent by Gover'ment." Mrs Durbeyfield was welcomed with glances and nods by the remainder of the conclave, and turned to where her husband sat. He was humming absently to himself, in a low tone: "I be as good as some folks here and there! I've got a great family vault at Kingsbere-sub-Greenhill, and finer skillentons than any man in Wessex!" "I tried her fate in the Fortune-Teller, and it brought out that very thing! ... You should ha' seen how pretty she looked to-day; her skin is as sumple as a duchess'." "Tess is a fine figure o' fun, as I said to myself to-day when I zeed her vamping round parish with the rest," observed one of the elderly boozers in an undertone. "But Joan Durbeyfield must mind that she don't get green malt in floor." It was a local phrase which had a peculiar meaning, and there was no reply.
" --Being a few private friends asked in to-night to keep up club-walking at my own expense." The landlady had rapidly re-used the formula she kept on hand for intruders before she recognized that the newcomer was Tess. "Hush--don't be so silly, Jacky," said his wife. "Yours is not the only family that was of 'count in wold days. Look at the Anktells, and Horseys, and the Tringhams themselves--gone to seed a'most as much as you--though you was bigger folks than they, that's true. Thank God, I was never of no family, and have nothing to be ashamed of in that way!" Tess turned the subject by saying what was far more prominent in her own mind at the moment than thoughts of her ancestry--"I am afraid father won't be able to take the journey with the beehives to-morrow so early."